We are now well and truly into the new year. Every new year ushers in change, bringing with it exciting bold styles and different trends to get your head around. When it comes to fencing styles, 2018 is no different. While there are a plethora of modern, funky twists in fence design, some of the tried and true traditional fencing styles will never go out of fashion. So, if your front yard is looking a little tired, why not try a new fence? You’ll be amazed at the difference it can make to your property. These are the fencing styles to keep an eye out for in 2018. This is a brand new style of fencing, and you’re sure to see it everywhere. It is the perfect blend of the old and the new. Traditional styles and ornate designs are made out of contemporary materials and techniques. The beauty of this style of fencing is that it offers all the benefits of aluminium. It’s durable, cost-effective and virtually maintenance free. It will look as good as the day it was installed for decades—all you have to do is hose the dirt off it every now and then. 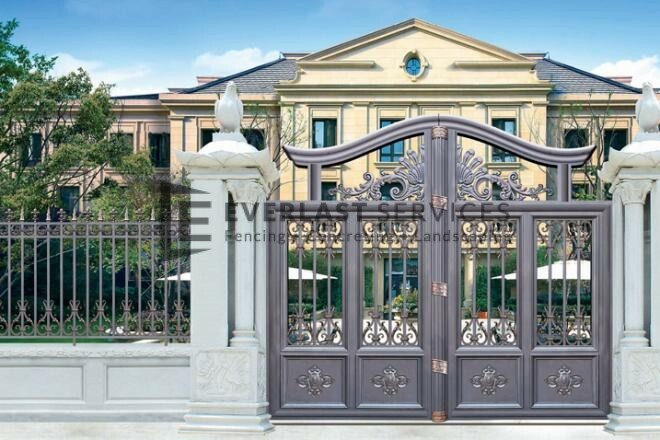 This fence will work perfectly on all types of homes, while also making for a particularly ornate and impressive gate design. Aluminium will never go out of style. It’s a go-to design and construction option because it allows infinite flexibility in craft, and its durable without being expensive. Aluminium slate fencing can be made to look exactly like wood slats, with powder coatings that mirror the vibrant hues of popular, but costly, hardwoods like Jarrah and Merbau. You can also leave the aluminium in its natural state for an edgy and modern design. Again, this style will work with all home styles, but the powder-coated slats look incredible with light-pallet rendered facades. This great Aussie material makes great Aussie fences. With an incredible choice of colours and Colorbond’s legendary reputation for toughness and ease-of-cleaning, you can’t go wrong with Colorbond. This option looks great with rendered facades, but thanks to the choice of colours, you can make it work with any property, from heritage to the ultra-modern. Modular fencing is the ultimate option for anyone looking for style at an affordable price. Thanks to the flexibility of the material, it can be made to look like anything – from brick to masonry and even tiles. You get to enjoy these aesthetics without dealing with the hefty cost and maintenance requirements that bricks, tiles and stone bring. The fence comes in panels, meaning it can also be set up in a fraction of the time of other fencing options, so you won’t only save on material costs, you’ll also save on labour. Another key advantage of modular fencing is that it is naturally soundproof, making it perfect for fencing in your backyard, so you can party well into the night without disturbing your neighbours, and vice-versa. Glass fencing has typically been used for swimming pool fences, but it really can be used anywhere. It’s perfect for fencing in balconies and verandas, and it can also be used a design element within your garden. The inherent fragility of glass means it isn’t a great option for a front fence, and it shouldn’t be used as a primary back fence for privacy reasons. Invisible brackets mean your glass fencing can look just like floating glass, and this adds endless visual interest to any area of your home. Love brick fencing but don’t want to commit to a fence made entirely out of bricks? You’ll love brick infill fencing. It allows you to create the fencing posts out of brick, and fill in the rest of the fence with almost any material you like. You can mix brick and hardwood for a beautiful, earthy look, or you can mix brick with steel for something a little edgier. Steel picket fencing will highlight the features of a heritage-style home. Blade fencing ticks so many boxes. It looks incredible, thanks to the dimensional look achieved by each blade, and it provides your home with incredible privacy and security. The difference with blade fencing is that it gives privacy without completely obscuring your home. You can still show off your front yard and have a view of the street, without sacrificing on solitude. The perfect mix of elegance and strength, and a display of artistry. Wrought iron fencing has been popular for centuries, and it will continue to be thanks to the flexibility in design it affords. You can completely customise your fence to suit your home and make it as open or private as you like.